We’re putting up signs to remind each other not to put up signs. Alert — and sign-sated — “06880” reader Chris Woods spotted that bizarre scene recently, at South Morningside Drive and Clapboard Hill Road. Chris notes that despite the Planning & Zoning Commission’s July pledge to crack down on illegal signs, they persist. “The floodgates have opened,” Chris says. “It’s a free-for-all, making our community look as tacky as possible. Chris would love the P&Z to levy a fine on transgressors — and pull any permits until it’s paid, and the sign removed. So who is the worst sign polluter in town? Click “Comments” below. This entry was posted in Westport life and tagged Chris Woods, Daybreak development, Sign pollution. Bookmark the permalink. Who’s the worst? Easy,the politicians. Laws and zoning regs be damned. But it’s the politician running unopposed who has signs posts posted just for their ego. I may be wrong, but I think the political signs do not fall under the same town restrictions as other signs. And hopefully they will all be cleaned up after upcoming elections. Ms. Sledge: You are indeed wrong. Please read the very last sentence. The political signs ARE temporary.  Town property includes traffic islands and road rights of way.  No sign may be placed on any school property without the prior permission of the Superintendent’s Office.  No sign may be placed within the interior of Compo Beach or Longshore Club Park.  No sign may be placed on Town Hall property.  No sign may be placed on trees or utility poles.  No sign may interfere with traffic visibility.  Signs on private property require property owner approval. Signs on private property shall not extend beyond the property line or into the Town right-of-way and is suggested they be removed within 2 days after the publicized event or election. organizations (i.e. local non-profits) may send the attached request, including proposed locations, for the placement of temporary signs to: Selectman’s Office, Westport Town Hall, 110 Myrtle Avenue, Westport, CT 06880 or selectman@westportct.gov.  A maximum of 15 signs are allowed for each such event. This includes directional signs. within 2 days after the publicized event.  The size of the sign cannot exceed 2 feet by 3 feet.  Non-compliance may result in the removal of signs. Political signs are considered an expression of free speech and are allowed on public property. The General Guidelines noted above apply to temporary signs for political purposes. Sec. 21-58. Prohibited locations. Advertisements and signs shall not be displayed within one hundred feet of any public park, state forest, playground or cemetery, or within fifteen feet from the outside line of any highway outside the thickly settled or business part of a city or town, except upon the walls of a building in which the goods advertised are offered for sale or the business advertised is conducted, and except signs erected by the state or a town or city which solely indicate highway directions, traffic regulations and dangerous places. No provision of this section shall affect any ordinance or regulation established by any municipality. Matt, I stand corrected. I thought I had heard Chip Stevens make a distinction about political signs. That picture is two houses away from where I used to live at 114 South Morningside Drive. Maybe the sign is a subtle hint for me to STOP my corny jokes on Dan’s blog? Morning;) I think westport has gotten less & less friendly over the years;( Instead of banning signs that people put up to help a given situation, (list dog, yard sale, for sale by owner or open house signs, how about having a few large designated and TIDY bulletin boards for people? I appreciate Stop & Shop and other places that have a bulletin board for their customers. I think we have lost the “helping your neighbor” mentality and it may be time to bring it back. Community oriented signs by nonprofits don’t bother me as much as commercial interests; Trainers coming to your home, Paving Co.’s etc, and Susan Holden who did not hesitate to pitch her business a few lines north of this statement. She evidently didn’t get the message. Yes, we are seeing more commercial signs popping up – Teak Furniture comes to mind, along with a Westport dating site. And yes, there are some realtor signs on corners. But to me, the most plentiful are the stick-in-the ground signs for local festivals, races and events, which seem to be posted on every major corner of town. Some organizations (left nameless) post multiple hanging signs on our downtown lampposts. Don’t get me wrong -these events are totally worthwhile – I am only making the observation about signage. How many realtors Laplace illegal signs? Why are some allowed to post illegal signs or realtors placing signs at corners of street when the house is not on that location? Builders and architect signs left for long periods of tine in addition to realtor posting? The issue of signs has become such a big deal in this country that it went all the way to the Supreme Court. The case of Reed vs. Town of Gilbert, AZ from June 2015 addressed signage laws having to do with the usage of temporary signs. The Supreme Court’s ruled that the content of a sign cannot be permitted to be treated differently. A sign indicating the directions to a business or activity, and a sign advertising an election candidate should have the same restrictions on them. Our Town of Westport seems to have strict signage rules in some cases, yet turns a blind eye in others. I give you the example of all the business signs on Compo Road North at the ball fields. 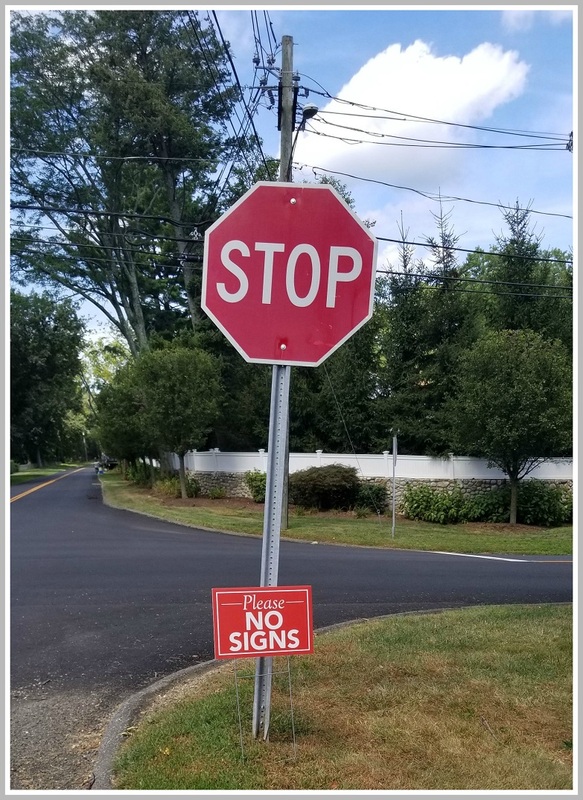 These signs do not meet the town of Westport’s own signage rules which were just published again in the Westport News last week. Like-wise, when the town feels like it, the Rec Department spoils the Beach and Longshore Park with an absurd number of signs. It’s my opinion that the biggest abuser of our town wide signage usages rules/ordinances is the town itself.